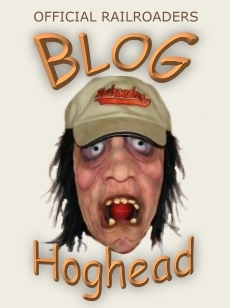 Fulton Railroaders Baseball Blog: A repeat of Last Year??? A repeat of Last Year??? The hunt for the OVL Playoff Championship title begins tonight at the Yard. Just like in the 2012 season the same first and second seeded team, Hoppers and Railroaders, will battle again for bragging rights in the off season. Déjà vu, anyone? If Railroaders are to take the best of 3 series, they will have to win the final game on the road in Hopkinsville. Tonight though, game one is in the Yard and the Railroaders can help the effort winning at home. Fulton won the first game at home last year, but dropped the next two in Hoptown. Time for a change? Will history repeat itself? On paper the two teams are appear evenly matched in both season and head-to-head stats. The only major differences are; the Hoppers steal twice as many bases and the Railroaders have 5 times the number of homeruns on the season. The Hoppers are 5-4 over the Railroaders in the season series. Reviewing the head-to-head contests; the Hoppers tend to win the close games and the Railroaders have mostly taken games with larger leads. We'll need all the bats tonight. One thing is sure, you can't turn your back on the Hoppers only ahead by a couple of runs. If you do...they'll jumped right over you at the last moment and cross the finish line first. Both teams play well against each other and the final post season games promise to be exciting ones. The final Home game in Fulton on the year will be tonight, so everyone come on out to support and cheer on the Railroaders. I'm sure the Hoppers will bring plenty of fans with them. This time let's change the outcome and take the championship round. Fire it UP! Loud and clear form Miami Springs Florida. Michael Diaz's parents. "Go Railroaders"
We would like to thank the whole broadcasting crew & cast (we know that list would be too long to list -haha) for a most enjoyable summer season of baseball. A great thanks goes to the lady that does such a nice job singing the national anthem. Most of all we would like to thank the Fulton Baseball organization for the opportunity our son has been able to experience for the summer. Here at the last home game. What a crowd! So excited to be here. We want to thank the entire Railroader organization/family. What a great experience for all of us-especially Sean. By the way-we owe you some nachos with jalapeños . 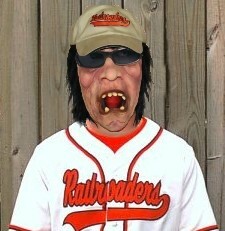 GO RAILROADERS!!!!! Can feel the excitement all the way here in Michigan! Wish we were there! What a game!!!! Shut down those Hoppers, Railroaders! Run 'em over!!! Thanks so much John & Josh (& Kire) for all of the home game broadcasts! We have enjoyed listening, and so glad to be able to hear the games when we cannot be there to watch. Great season for the Railroaders! Keep that train rollin! Let's win it all! Thanks to all of the Railroaders organization for a great summer! It has been a great and fun experience for our son Cody. We very much enjoyed our visits to see the games we did get to come to. Could have sworn Skoubo had 2 strike outs when he pitched. Been busy painting the house while listening. Looking at the play by play guess it wasn't so. Fulton was way out managed last night by the Hoptown manager. Fulton manager left pitcher in when he was tired. pitching after that went down hill. Hope tonight is a better managed game or it will be the last. got to keep heads up and focused. I agree 100 percent. Hatch should have been pulled after 6 innings. You guys made us all proud. Way to go!!!! Congratulations Railroaders!! !